A few weeks ago we went over to Phra Pradaeng for a little bike ride. As we’ve mentioned in our post about Bangkok’s green spaces Phra Pradaeng is a lovely break from the bustling city. While we were there I saw this little Gnome on top of someones fence, next to the gate. Potentially this isn’t an oddity of Thailand as I know gnomes are common all over the world but this one was unlike the little colourful funny gnomes we have in NZ, I wondered what the significance of this gnome was. He was slightly off putting with his army fatigues and machine gun, maybe that was the point – to say to passersby don’t mess with this house we have our own security. 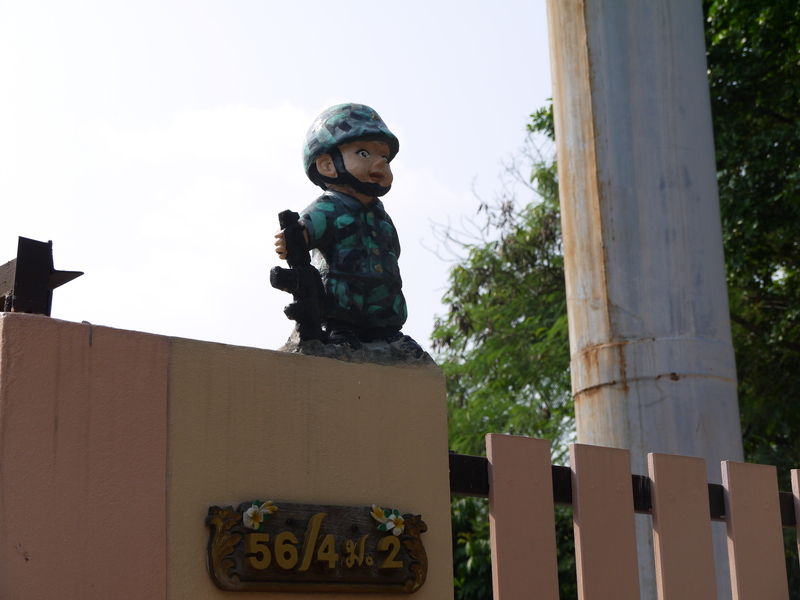 Funnily this gnome wasn’t the only one we saw while we cycled around Phra Pradaeng. I especially liked the couple we saw on the front porch of the place we had lunch, they were a little bigger than this one but the chubby, cheerful form of security guard which is a common sight with the live versions as well. The security guards at our building would have to be included in the cheerful and friendly group. I’m still getting use to being saluted at when I enter the property. They always do their jobs with smiles on their faces and are eager to offer a giant umbrella and walk you to the door when it’s pouring down and you’ve forgotten yours.